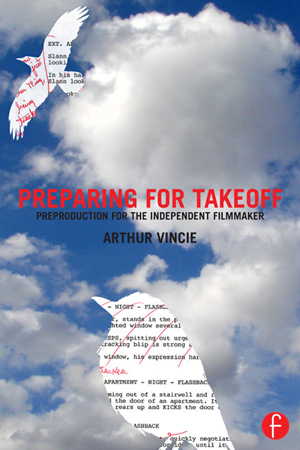 A comprehensive, nuts-and-bolts guide to preproduction, from both the producer’s and director’s points of view. Published by Focal Press. Available now on Amazon. The official book site has additional sample budgets, forms, and other materials you can download for free! Mixing Fact With Fiction in Three Trembling Cities, written on how we integrated fiction and non-fiction storytelling in Three Trembling Cities. From Scene to Screen: The Process of Bringing a Scene to Life in Three Trembling Cities, written in Fall 2016. Available online. The Beginner’s Guide To Budgeting, written for their Fall 2014 MovieMaker’s Guide special issue. Now available online or in print. Surviving Your First Film Market, a quick how-to guide on how to survive – and thrive – based on my recent experience at the American Film Market. Seven Reasons To Stop Working On That Script. We’ve all been there – you’re trying to finish (or make) that passion project. But sometimes, it’s better to call it quits now than bang your head against the wall indefinitely. Thinking About Extras. At some point, you’ll need background actors for your script. But a lot of indie producers don’t think about what goes into their care and handling, and what other elements (food, space, transportation) you need to budget for. Thinking About Crew Prep. Whatever your budget, you’ll need to hire your crew before you start shooting. How much prep do different departments need? Budgeting Favors – Your cousin says you can shoot in his apartment for free. But what does “free” really mean? You Can’t Have Enough Drives. But maybe you can budget for them. Give The Art Department Some Love. Another department that gets thrown under the bus on indie shoots. Apple Doesn’t Like Indie Filmmakers. Yes, I said it. Transportation, Your Biggest Headache. How to budget and manage transportation on indie shoots. Part II. You’ve got a distribution deal, now it’s time to deliver it to the distributor. Working With Your Colorist. Color correction basics. Print articles in Indie Slate and Student Filmmaker on budgeting, post and other topics. Facing America’s Basement, on Medium. America has never faced its foundations in racist and xenophobic ideology, beginning with the theft and genocide of Native tribes and the exploitation of enslaved Africans, natives, indentured servants, and women. We will not become the ‘greatest’ nation we aspire to be until we make amends for it. Eulogy for My Mother, on Medium. In March of 2017, my mother died of lung cancer. I try to do some justice to her painful and also miraculous life. It’s Time To Stop Policing Society, on Medium. We keep reaching for the police as the first tool in the toolbox to deal with social issues. How can we get past this tendency? The Abuse of Evolution, on Medium. The mechanics of evolution are NOT the same as those behind the marketplace or the economy. Evolution is far more complex, and beyond our collective control. So why do we keep framing the rules of the marketplace in terms of a watered-down, faulty understanding of evolution?